A datacentre facility is quite simply a managed and controlled environment in which to run file severs to store, process and deliver information to connected users. A datacentre may be an enterprise facility serving the needs of the organisation or a colocation one that sells space and service to multiple clients. In terms of the management and control of this environment we are concerned with critical power and cooling within the facility. Servers generate heat and the white space needs to be cooled to prevent over-heating and a fire risk. The critical path, from the mains income to the server AC power inputs also requires power protection in order to maintain the service(s). There are several power protection strategies that can be deployed. At the server rack level, most server power supplies have dual-redundant ‘A and B’ AC power supplies. The ‘A and B’ supplies will generally powered from separate power distribution units (PDUs) which should be intelligent and capable of remote monitoring over the IP network using SNMP. Monitoring information could include kWh energy usage, especially important for colocation client billing and energy efficiency monitoring, power capacity in terms of VA/Watts and allow for remote socket reboots. The PDUs should be supplied from an uninterruptible power source to maintain power to the servers when there is a power cut or fluctuation. Installing uninterruptible power supplies ‘In-rack’ or ‘In-row’ represent a decentralised power protection strategy. Each sever rack may have a rack rack mount UPS system installed with a built-in battery pack or separate battery extension pack. The PDUs generally plug into the UPS output sockets or may be hardwired. The UPS system itself should be installed with an SNMP monitoring card for remote monitoring and controlled automatic shutdown for prolonged mains power failures. The UPS will generally be a single-phase input and output system and may be installed with a rack mount maintenance bypass to prevent server downtime if the uninterruptible power supply has to be removed or powered down. In this instance the server loads may be powered from raw mains via the PDU. ‘In-row’ UPS systems are again a form of decentralized power protection. For this strategy a larger UPS system is installed at the end of or within a row of server cabinets. The electrical planning for this type of installation is a little more complex as all electrical connections will be hardwired and either under the raised floor or overhead in cable trays to the PDUs within the server racks. The UPS may be a 3-phase system configured 3/1 or 3/3 or a single-phase uninterruptible power supply. Again the UPS is installed with SNMP for remote monitoring and the battery may be internal or installed within a battery extension cabinet. The battery cabinet may be in the white-space or outside the IT space within a separate battery room. The further the distance from the UPS, the more costly the installation of the DC battery cables between the uninterruptible power supply and its battery pack. As the distance increases the size of the cable has to increase to overcome distance-losses. An advantage of having the battery outside the white-space is that the ambient within server side of the datacentre can be allowed to rise. Batteries require a 20-25degree Centigrade ambient in order to prevent heat damage. A centralised UPS system is a more complex power protection strategy and will generally be installed as a 3phase system. 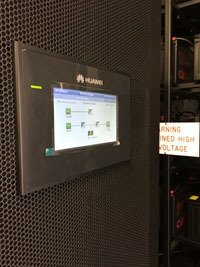 An uninterruptible power supply is installed to protect the entire facility loads – critical and essential. A battery pack is installed within the UPS room or a separate battery in a cabinet or on a cladded or open battery stand. A wrap-around bypass provides a complete method of isolation of the UPS for maintenance and any upgrade work. If two UPS are installed in a parallel/N+1 configuration, they are sized to share the load with either one capable of powering the entire load. The UPS systems are connected to the datacentre DCIM package for remote monitoring and control via SNMP. If there are separate ‘A and B’ mains incomers, then UPS systems will generally be installed to provide power protection to both and for added resilience in parallel/N+1 UPS groups. This is a 2N form of power protection as classified by the Uptime Institute Tier-rating system. A standby generator or set of parallel/N+X generating sets may also be installed. In-row and centralised power protection strategies can be configured using either traditional mono-block or modular uninterruptible power supplies. The modular approach has always been associated with a higher initial capital cost but lower Total Cost of Ownership (TCO) as it offers a greater degree of flexibility and both vertical and horizontal growth strategies. For a free datacentre power protection audit contact the Eco Power Projects team. Our team includes CDCDP and CDCEP trained auditors and experts in power protection.